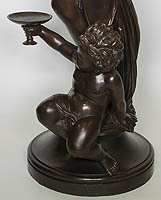 A Large French 19th Century Cast-Iron Group of "A Maiden with Putto" After a model by Pierre Edouard Charrier (French, 1820-1895) and Possibly Cast by The Val d'Osne Foundry in a brown patina. Circa: Paris, 1880. Pierre Edouard Charrier (1820-1895) Sculpteur Ornemaniste (Sculptor and Ornament Designer) Born in Niort where he started to work before moving to Paris to 24 years in 14 ° where he lived almost until his death. 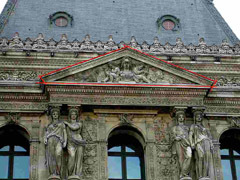 His most notable works are the crests at Le Tribunal de Commerce, l’Hotel Cail (actuellement Mairie du 8° arrondissement) in Paris as well as twelve sculptures at The Louvre Museum in Paris (Palace of the Emperor Napoleon III) (See images below). The foundry of Val d'Osne became highly regarded for the varied nature and quality of its castings in the second half of the 19th century. Commonly known after 1870 as simply Val D'Osne, the company was originally founded by J.P.V. André in Val d'Osne 1835 and developed rapidly, absorbing smaller foundries in the Haute-Marne area east of Paris. 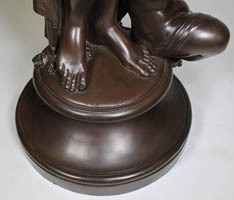 The foundry contributed to the London International Exhibition of 1851, where a bronze fountain cast with classical figures attracted much attention. André also specialised in fancy castings and architectural fittings. His Paris adress was at 14 Rue Neuve, Menilmontant. In 1855 the Barbezat & Cie Foundry was born out of the André workshop. In 1867 Barbezat & Cie changed its name to Houille & Cie. Then, in 1870, it changed its name to Société Anonyme du Val d'Osne. With the change of name came the change of casting mark and adress: Fonderies d'Art du Val d'Osne, 58 Bd Voltaire, Paris or simply Val d'Osne. Cast-iron had been in production during the 18th century but its inferior status to the more fashionable and delicate wrought-iron had generally confined its use to architectural work. By the early 19th century, however, rapid developments of the Industrial Revolution combined with the simultaneous burgeoning of a new middle class provided the impetus for a dramatic expansion in its application and in a short space of time a proliferation of iron foundries across Europe and America thrived on the production of everything from inkstands to railway stations. The use of cast-iron for garden ornament became particularly widespread at this time, as the possibilities for its mass-production at a fraction of the cost of bronze made it the material of choice for indoor/outdoor statuary, figural lighting, fountains and vases. Nowhere was the popularity and use of cast-iron ornament greater than in France, where by the second half of the 19th century two foundries in particular had come to dominate production both for the home market and for export. 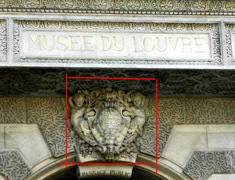 The more important of these was the officially named Société Anonyme des Hauts-Fourneaux et Fonderies du Val-D'Osne, Anciennes maisons J.P.V. André et J.J. Ducel et Fils. Smaller than Val D'Osne but nevertheless a major player in the manufacture of cast-iron was the firm of A. A. Durenne, established in 1847 at Sommevoire. Both Val D'Osne and Durenne were frequently awarded medals for their work at the many international exhibitions of the latter half of the 19th century. Each also published large catalogues illustrating and listing its entire inventory of models, from which casts of varying size and finish could be ordered.